If you're trying to play Gran Turismo 5 at the moment and wondering why everything is stalling and running so slowly - even in your singleplayer games - you can thank "extreme online traffic congestion". While that's a common and understandable thing to be affecting the multiplayer side of a major game so close to launch, having server problems screw up a singleplayer game is both less common and incredibly frustrating. 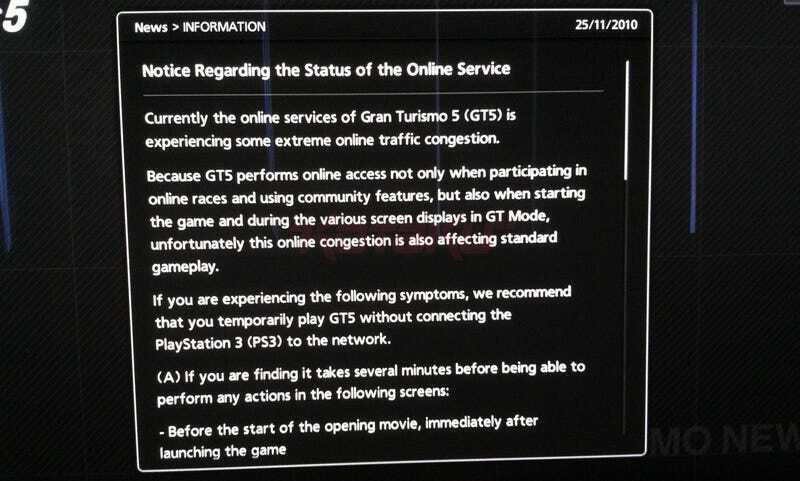 While the "extreme online traffic congestion" lasts, users are being warned that even such basic things as moving through the game's menus can result in delays of "several minutes", as GT5 connects online not just to race against other people, but also "when starting the game and during the various screen displays in GT Mode". In an attempt to "temporarily alleviate" the problem, Sony has cut off all user access to the viewing of logs, and in many cases changes to user profiles and changes to friends lists as well. While Sony work to fix this problem, users are being told to disconnect their PlayStation 3s from their network and play in offline mode.